To unlock, turn key and push in button. Stamped steel with an antique brass finish. Measures 2-3/8" x 2". Child Safety Feature - This lock cannot be shut without pushing in the button on the front of the lock. Therefore, a child cannot get into the chest and be accidentally locked inside. Restored an old Murphy 23 chest to sit at the foot of my bed. Thanks for your product i fully restored it with the original key. Very happy with your company and if i restore more furniture later i know to check your site for those hard to find parts that no one else has. I'm sure i will use you in the future. My part came fast and prices were reasonable. Many Thanks Rockler! Well packaged and arrived promptly. Appears to be well made, installation was straight forward, lock worked well after installation compared to some that have started binding after tightening the screws. I love the child safety feature. It is wonderful. I bought it as a replacement for an old broken one of similar design. The fit was perfect. I have a cedar chest from the 1980's and after moving couldn't get the lock to open. Your video was a great help. After watching it, I go my cedar chest opened after 5 years. Thank you so much. I would definitely recommend this product. 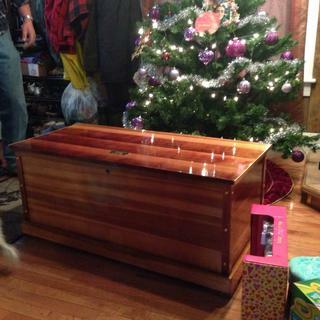 I made my granddaughter a cedar chest and it worked perfectly on it. Will be ordering from you again. I bought this lock to replace a broken lock in a chest. It fit perfectly & works great. This is a well constructed item. Easy to install. It was just what I needed to finish my restoration. THE LOCK WORKED GREAT ONCE I HAD A FLUSH SURFACE TO MOUNT IT ON. IT WAS A REPLACEMENT FOR LANE CEDAR CHEST LOCK. Easy to order, came on time, easy to install and worked perfectly. I purchased an old cedar chest that had a lock that wasn't working. Found this one. It was easy to assemble and works perfectly. Bit tricky to install, but works great. Did not get instructions with the shipment, but got on-line at Rockler. Lock works perfectly in my chest! What's to review? It's a lock, for cryin' out loud. I ordered it, it came, it does what it's supposed to. What else can you want? It satisfies every woodworker's desire: it's shiny (sorta), it has moving parts and screws. 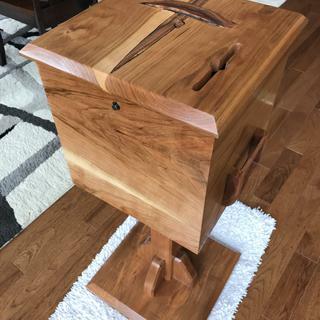 I used birch to build the blanket chest, Minwx &quot;Red Chestnut&quot; for the stain, and Minwax Polyurethane (Clear Satin) for the finish. The chest lock and latch were just what I needed to complete this project. Excellent product from an excellent company. Have to hold down lid and push button at the same time, to open and close chest..Works differently than original lock..but works. The mechanism forces you to engage button to allow the hook up before the key is used . The Texas State Trooper is enjoying his Cop Caddy!!! great produce for the price,very simple to install. Worked well for my application. Easy to install. This is the 2nd. Cedar Chest, and this latch was made for this project perfect. A decorative collar would be nice to dress up the outside surface of the latch insertion site. Have not had it installed at this time, but I am sure it will work. My daughter will be home and will help me. The new lock was easy enough to install. The actual operation of the locking mechanism is very tricky. I had to watch the video on your website in order to get it to work. 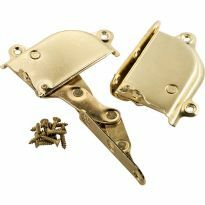 This was a replacement latch required after carpet installers lifted the cedar chest by the lid and broke the lid part. The new one fit & was easy to install. It's a shame I have to buy the whole set to get the smallest part! the lock works fine. However, I was very disappointed it only came with one key!!! additional key required. Even the most simple instructions would be helpful. For example the drill size. Plus some suggestions on how to locate the exact placement to drill the hole. Also how to locate the location of the top latch. Although I was able to do so using calibers to measure the diameter for the hole and using the two prongs (thank you) to locate the latch position. It would have been nice to include simple instructions for those who might not understand. 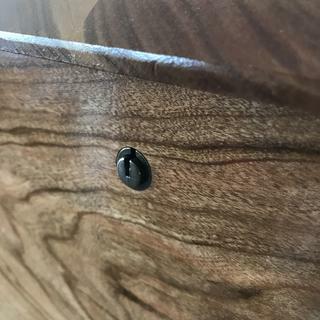 I have purchased several of these locks for cedar chests I have built for people and I have no complaints about the quality of construction of the piece. I do wish to say that it would be better if it came with two keys though instead of just one. 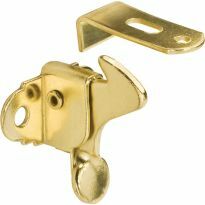 This latch was just right for my application, and worked out very nice. I'm no woodworker, but things like this latch made it a whole lot easier. I like this lock. It seems to be a pretty good product. The body of the lock appears more compact than I expected. The quality of the key could be a bit higher, perhaps. The lock appears quite durable. The mounting screws provided are flat head screws. The lock body screw holes are not countersunk. This would lead to an appearance issue if these mounting screws were installed (flat head screws without countersinks). I recommend the use of pan head or truss head screws in the same size for lock body installation. The appearance is much more professional and the screw-to-lock contact surface is more controlled. The flat head screws are appropriate, however, for the lid rail. 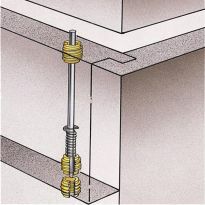 Note that the installation instructions require a 9/16&quot; barrel hole for mounting the lock. In hardwoods, I typically use a Forstner bit for cutting such holes. A 9/16&quot; Forstner bit is not a common size tool. That gave me the opportunity to enlarge my Forstner bit collection. I made a special jig for maintaining bit perpendicularity during drilling. Installed, the lock works well and looks great. Did not fit the Lane chest I was redoing. I will be returning it. Discovered I could get a free replacement from the company that bought out Lane. Safety recall.Seems to be a good latch but difficult to work lock properly. Rockler went so far as to produce a video of how to operate it. Good luck remembering how a year from now! It is okay but not what I really had in mind for a chest lock. works well easy to install. Wound be better if it came with a spare key. The lock was perfect for my application and was easily mounted. I do feel it is a bit pricey after shipping is applied, but I would use it again. The item that I received was antique brass only on the lock key part that goes through the wood. The rest of it is silver color, including the screws. Very disapointed in this. The cedar chest you see in the picture has the same lock but in antique finish over the whole thing including the screws. I took this lock off another press board cedar chest that a lady had and she installed the toy box hinges incorrectly and it broke out the lid hinges. She gave me her press board cedar chest to fix, and I made her this one and took the hardware off hers and added it to this cedar chest. I need this for a toy chest build for my new grandson! Perfect fit for the application on which I am working. The lock on my cedar chest broke....hopefully this is an exact replacement.. I am replacing a lock on an older cedar chest and this is the only one I found that looks like it matches the old one. for hope chest I am building for my grand daughter. replacing original lock that was broken. Couldn't find one at any of my local woodworking places and this looks like it will fit the cedar chest I'm refinishing for my daughter's place. Thanks Rockler! Good feedback from a friend of mine about your products. Using this for a cedar chest for granddaughter. Have used in the past, and they work well. Needed a replacement lock & latch for a chest I am restoring, wanted child safety. Quality, able to conceal lock for compartment in small bench. I have used this before on cedar chest and it works fine. Relatively easy to install. Lid catch can be a little tricky. 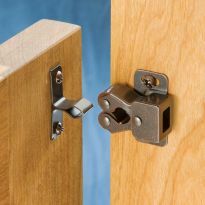 Lock is for privacy only and may require some custom inset work if thicknesses are other than 3/4 inch. I am building a cedar chest and needed a lock. I've used this in the past and it worked well. simple and safe. This also is the first time to try this lock. To replace existing one I bought from you 10 years ago that broke. So it's an exact match. Not pleased that it broke though! Ordered this in the past and works great. My wife's cedar chest is over 100 years old and this is the closets' one I could find hope it works ok.
Making a hope chest for our granddaughter. Replacing one just like it on my cedar chest. It seems to be identical to one I need to replace. I have an antique chest that needed a lock. This item fit the bill. We had an issue with our lock sticking. We watched your video and found it very helpful. Thought it was a good time to replace it. The last one I bought from you quit working. I have used this before an it worked great. Used before and liked it. CAN I GET THE KEY ONLY FOR THIS LOCK? BEST ANSWER: Replacement keys for this lock are available from the Rockler Technical Service department.. The key is item number 55652, and the cost is $1.99. BEST ANSWER: I have a lane cedar chest with lock. That lock in not a surface mount - it is recessed into the wood and the latch on the top hits the chest wall about mid-wall width. 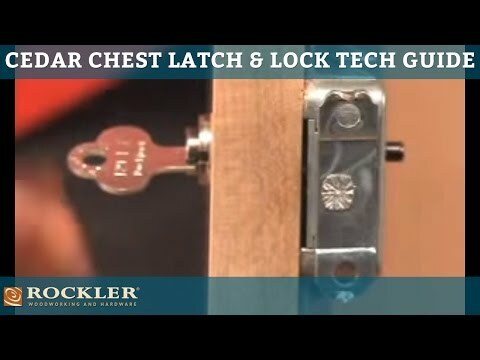 This lock is a surface mount and works very well and I have put them on a number of cedar chests that I have built. 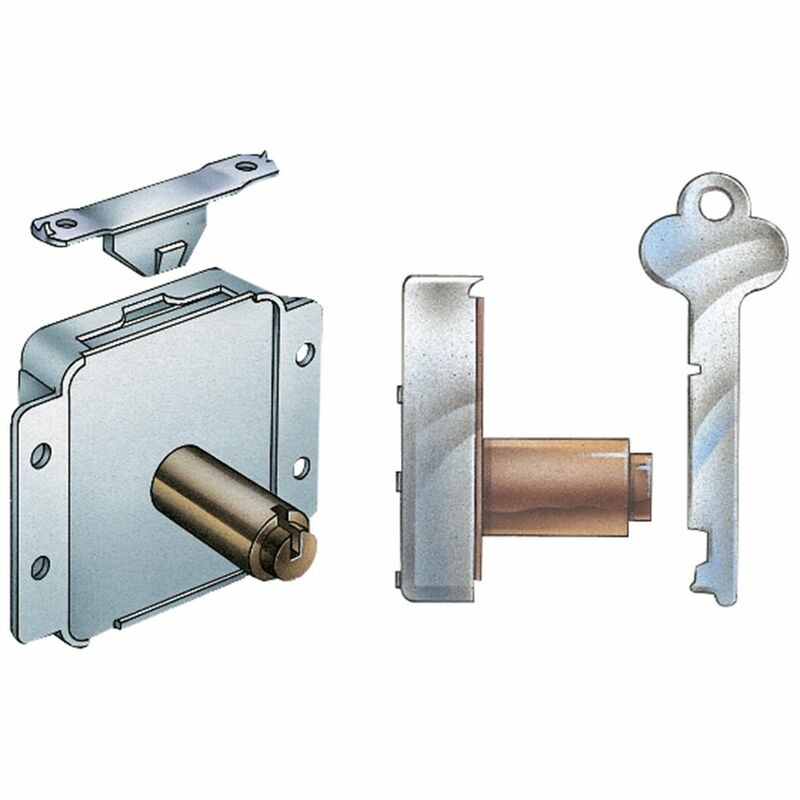 The latch on the top meets the locking mechanism about 1/8 inch beyond the wall width. Therefore it would be very different, but that said. It will replace your lock and the will surface mount. you will have to remove the latch and install the new latch in the correct location. Any handy person can make it work, but it is not a direct replacement. button will still through hole, key will work great. surface mount might need some fill-in pieces, and old latch will have to be removed and the new latch installed. Have fun. Can an additional key be purchased ? BEST ANSWER: Yes. The item number is 55652, and the item may be ordered by phone at 800-279-4441. This does not appear to be a good part number, when I use the search feature and this part number there are no results. I want to order a lock set with 2 keys. Will this lock work on a Roos sweetheart chest? I have an old cedar chest but have lost the key. It's a Lane and about 50 years old. Is there a way to get a new key made if I remove the whole locking mechanism and take it to a locksmith? Thank you for this reply. I'll try that because after looking for locks that fit over the edge of the front wall, and having no luck I just gave up. It would be nice to be able to lock it again. Have a wood jewelry display case glass front & sides, key is lost. We drilled out locks, now need 2 locks, what type of lock should I look for? BEST ANSWER: I don't think this is what you need. This is made especially for a cedar chest, and it's designed to prevent a child from getting locked in. 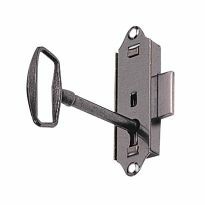 There should be another type of surface mounted lock that would be better suited for your needs. I repaired an old Lane cedar chest for a customer with the surface mounted lock sold at Rockler. However as with most older pieces, the old lock was recessed into the wood and I had to fill in the hole before installing the new one. This also required moving the door latch location to align with the new location of the lock. Since I could not find a recessed lock I tried this one and was successful with a little extra work. I hope this helped you Nina! This lock requires a bit of pressure to work, would not recommend for a jewelry case. Sorry. We used one for a cedar chest and it worked well. However, we are not planning on using the key. I have a stewart norwalk cedar chest Tennessee ref cedar. And I'm missing the key do you have a key for it ? Or a lock that I can replace with a key that will fit ? BEST ANSWER: That doesnt really answer my question tho... will the lock fit on my particular chest tho ? I purchased a new lock from Rockler because ours was broke. It came with a new key. What to do if the lock is stuck and the chest will not open because the button will not push in? Have not had this problem . May want to try WD 40 . Lock is tricky may try inserting it from another direction and press diwn on lid. How do I get the old lock out? Do I just pry it? I have the screws out but it's not budging and I'm afraid of breaking something. Thanks. I have pried so hard that the inside casing of the lock is bending. You're probably right, it's glued in place with varnish. Mark, you might want to try a hammer and punch. It might shock it enough to start it moving. Try twisting the mechanism while at the same time push on the face of the lock. Very tight fit,but you’ll find it just prying it out will work. Yes, it should pry out from the inside of the chest. What is the length of the key barrel? BEST ANSWER: If I remember , the key barrel was 7/8" the barrel does stick out just a bit when using 3/4" lumber. I have installed this lock in six hope chests for my granddaughters. I chose this lock because the kid can not get locked inside the chest accidentally. I mounted in 3/4 inch material and fit just right. It's not near me but I think it's 3/4 inch. Do you have a lock and key for style 1400 Lane cedar chest? BEST ANSWER: I have made 5 cedar chests and used Rockler’s part number 28233 on each of them. They worked really well. Had no problem installing them. I did not use a lock on my chest. The hinge worked great! How to unlock the box? Turn key clockwise press button . Can be tricky to lock and unlock just have to keep working with it. Key will go in either way but will only work if inserted correctly. Do you have this in a rustic brown finish? Can I install this through a 2x4? I have a cedar chest that needs a replacement lock, but the front panel is deeper than most. It is 1 1/8” deep. Any ideas where to get one that depth? 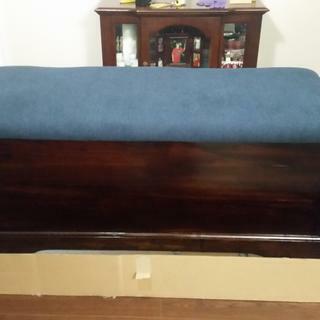 I have a Lane Cedar Chest Style NO. 2210 Serial NO. 849201 and the lock popped out a few months ago where one of the springs was lost. So now I am trying to find a replacement lock and I am just wondering if this lock would fit my cedar chest? BEST ANSWER: I built two cedar chest and these locks worked very well for me. I have a broken lock from National Lock Co. Pat#91918879 in brass. Is this a replacement for that type lock? BEST ANSWER: By the picture that is shown, it is the same lock. It has a safety feature that a child cannot accidently lock oneself in the chest. I have a lane cedar chest lock model # 25-1 . I want to replace it. Can I use the model# 28233 ? BEST ANSWER: As near as I could determine the lane cedar chest lock model 25-1 is recessed into the front of the chest. I do not have the dimensions of the recess. 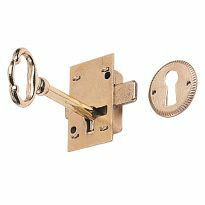 The model #28233 is a surface mounted lock that mounts on the inside of the chest with a through hole to accommodate the key cylinder. If the recess area does not interfere with mounting of the model #28233, theoretically, you could use it as a replacement. However, you would want to fill in the void (recess area) in some manner to get a clean look to the completed installation. I would advise that you search the Internet on the lane cedar chest lock model # 25-1 as there is a safety issue with that lock as it relates to small children potentially locking themselves inside the chest. Good luck. I have a Shaker chest of drawers with 2 cabinet doors. I keep my medicine in one. I want to install a lock on this so my grandkids cannot access. It appears that the cedar chest lock would work well for this. Do you think so or do you have something else for that? Hardware is dark antique brass. Thank you.